Ferns are non-flowering vascular plants having true roots (through rhizomes), stems, and complex leaves, and which reproduce by spores. Their leaves have branching vein systems and young ones usually unroll "from a tight fiddlehead, or crosier" (EB, cited above). They are extremely diverse in habitat and form, and range in size from less than 1/10" to some 90 feet in height ("tree ferns"). 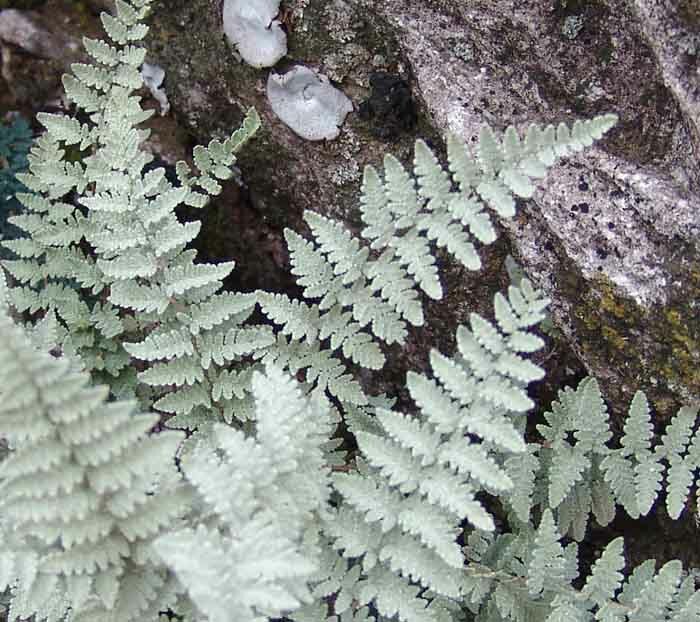 Most ferns occupy warm, moist places (especially the tropical rain forests), decreasing in number with both latitude and dryness, but some have adapted to drier and cooler climes. Fern spores are very tiny, each a single living cell, protected by a thick wall and readily dispersed by wind. 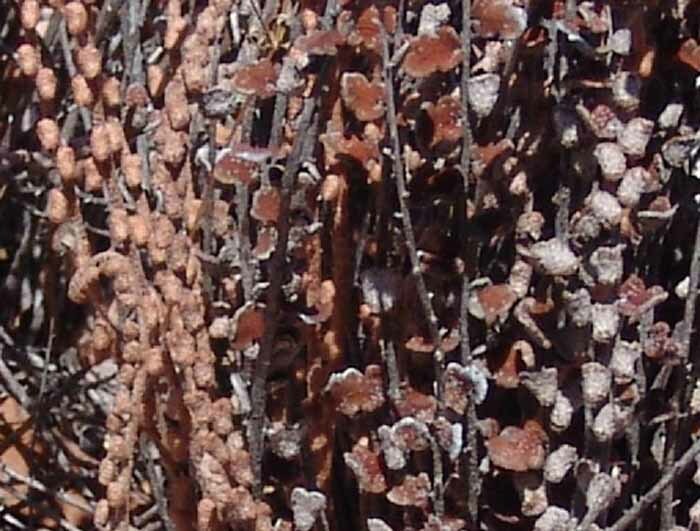 In the banner photos at the top (of our local uplands fern), the spore locations may be seen. 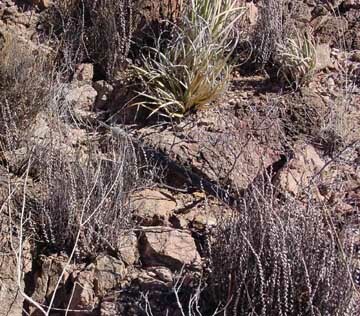 Below, we again see this kind of Fern on a high Willow Canyon Formation terrace above Hot Springs Canyon, just after strong winter rains in early March 2004. This photo clearly shows the characteristic "unrolling tight fiddleheads" of the fern. Click on the image for a close-up. Below, a set of ferns from above the Notch Camp (near the green image from July 2003, above) which have dried out by May 10 2004. 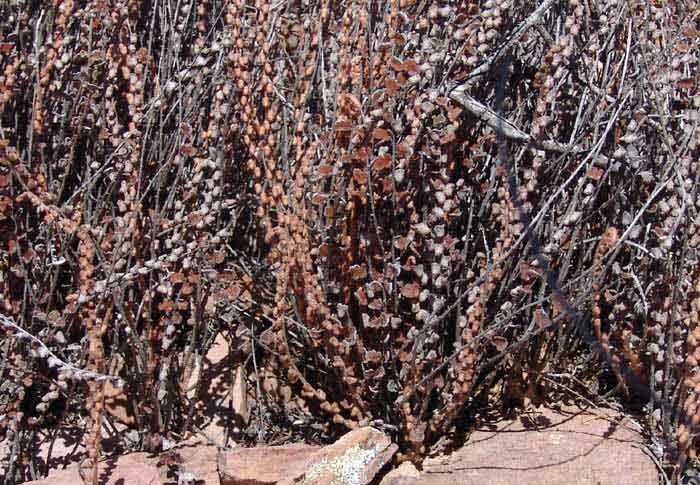 In November of 2002, in severe drought, the same group of ferns looked like this, below. 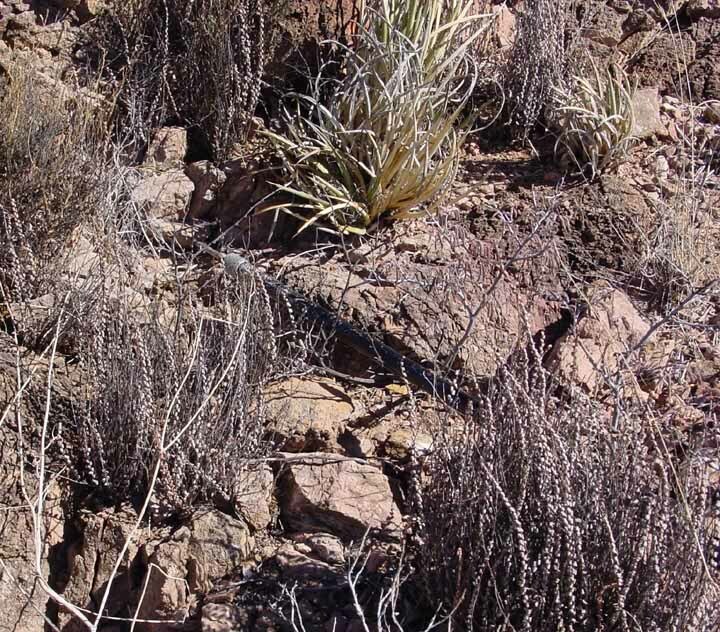 In the middle of the left image, a suffering Shindagger Agave sits at upper center, amidst the dried-up ferns. 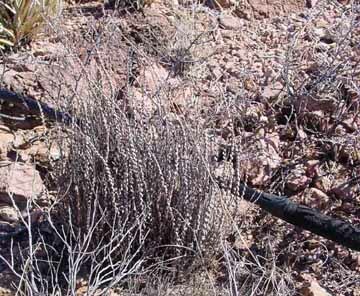 In January 2005, we saw this very different kind of fern at the base of a cliffside in Upper Cottonwood Seeps Wash. This part of the canyon is quite steep, with rainwaters flowing in sheets down the bedrock slope, the bottom of which you see here. 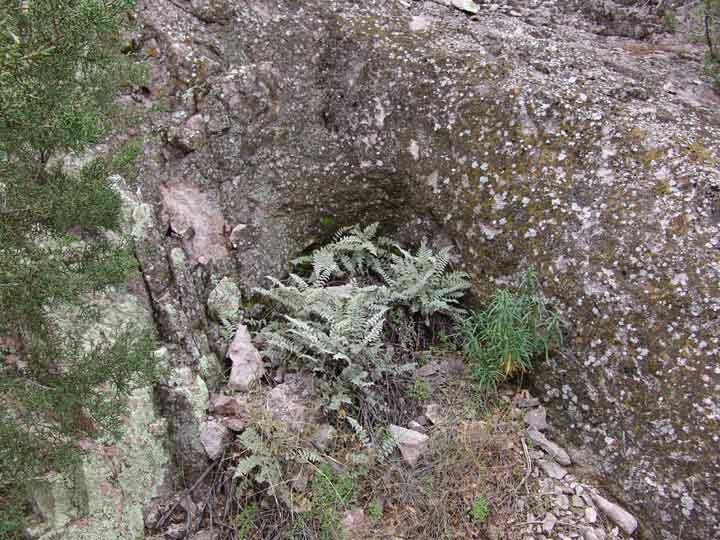 This fern has established itself in a small pot-hole at the base of the slope, where the darkened surface in top-center of the photo shows how runoff flows into the hole. The plant at far left is a juniper. Click on the image for a close-up view of this fern. A fern illustrated in Epple (p. 10, pl. 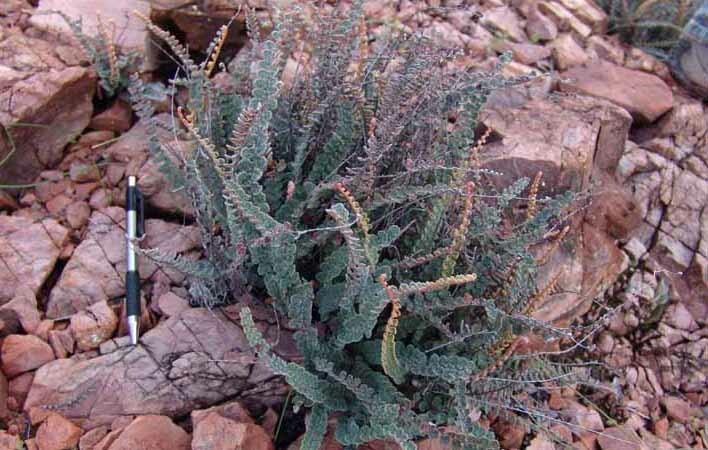 16) that looks like this plant is a Flower Cup Fern (Woodsia sp. 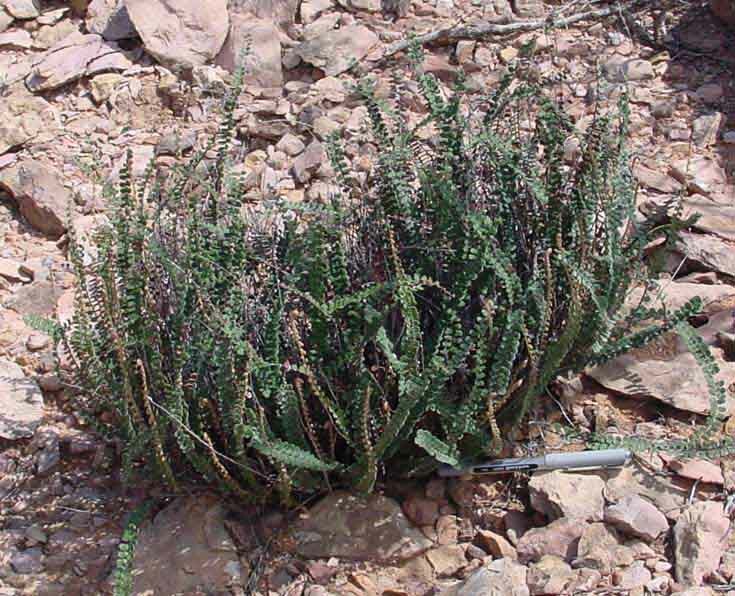 ), known for prefering "the shade of cliffs and rock ledges", but according to Jordan Metzgar (see above) it looks like a Cheilanthes. We need to examine it more closely. 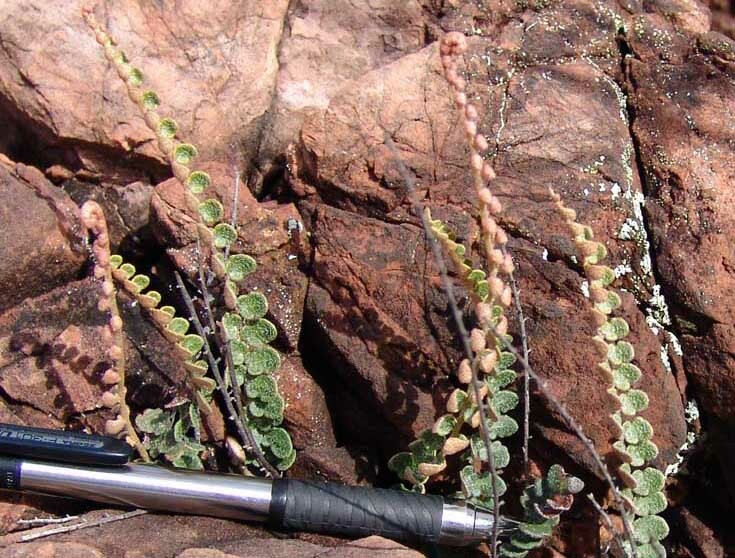 The Ferns of Arizona webpage contains excellent photographs, covering somewhat over half of Arizona's fern species. For additional information on Fern species in southeast Arizona, see this link: EB Fiero's Desert Ecology page.